RICHARDSON, Bill, a Representative from New Mexico; born in Pasadena, Los Angeles County, Calif., November 15, 1947; graduated from Middlesex High School, Concord, Mass., 1966; B.A., Tufts University, Medford, Mass., 1970; M.A., Fletcher School of Law and Diplomacy, Medford, Mass., 1971; aide to United States Representative Frank Bradford Morse of Massachusetts, 1971-1973; legislative management officer, U. S. Department of State, 1974-1976; staff. U.S. Senate Foreign Relations Committee, 1976-1978;international business consultant; unsuccessful candidate for election to the Ninety-seventh Congress, 1980; elected as a Democrat to the Ninety-eighth and to the seven succeeding Congresses, until his resignation February 13, 1997, (January 3, 1983-February 13, 1997); unsuccessful candidate for the Democratic presidential nomination in 2008; United States Ambassador to the United Nations, 1997-1998; Secretary of Energy, 1998-2001; Governor of New Mexico, 2003-2011. 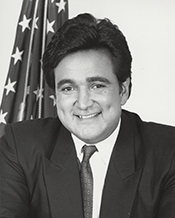 Bill Richardson in Hispanic Americans in Congress, 1822-2012. Prepared under the direction of the Committee on House Administration by the Office of the Historian and the Office of the Clerk, U.S. House of Representatives. Washington: Government Printing Office, 2013.